Mitron (lit. Friends; Hindi pronunciation: is a 2018 Indian film produced by Vikram Malhotra, presented by Abundantia Entertainment and directed by Nitin Kakkar of Filmistaan fame. 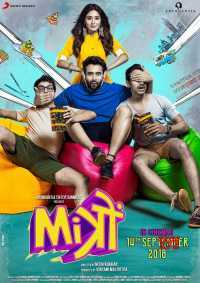 Set in the backdrop of the Gujarati milieu, the film traces the journey of Jay (Jackky Bhagnani) and Avni (Kritika Kamra), as they set on the path of finding themselves amidst their social and cultural backgrounds. The film also stars Pratik Gandhi and Neeraj Sood in pivotal roles. The movie is slated to release on 14 September 2018. This movie is an adaptation of 2016 Telugu film Pelli Choopulu.